uuid : f72bd1a7-509a-40fd-a2e6-0d147d430475 templates_id: 119558 templates_uuid: "93a10821-6c7b-44af-b7a4-e8495f852384" title: "At Risk of Redundancy Letter - Create a Risk of Redundancy Letter" display_name: "At risk of redundancy letter" meta_keywords: "Letter informing employee of the risk of redundancy" description: "
Start your redundancy process correctly using this at risk of redundancy letter. When considering employees for redundancy you should make sure the proper process is followed and that employees remain informed at all times. Use this risk of redundancy letter to sensitively explain to employees that their job may be at risk due to a number of specified business reasons and what will happen next. You do not need to use this letter if you are just making one employee redundant who is a unique role and there is no element of selection. What is an at risk of redundancy letter? An at risk of redundancy letter is a formal letter informing employees that they are at risk of being made redundant due to specific business reasons. Why do I need a letter informing employees of the risk of redundancy? Informing employees of the risk of redundancy shows that you are following a fair and consistent redundancy procedure and that you are concerned about employees\302\222 welfare. It ensures employees are aware of the situation at an early stage of the process, and gives them the chance to explore alternative options before being made redundant. Can alternative employment solutions be looked for after sending this letter? Yes,this letter is not the final redundancy decision, and alternative employment solutions can still be looked for throughout the whole redundancy process. What\302\222s the next step after sending an at-risk of redundancy letter? If you are planning to make more than one person redundant, the next step should be the selection process, whereby you will select the redundant staff objectively, through clearly defined selection criteria. For more information read Redundancy pooling and selection before going forward with redundancy. \r\n" created_timestamp: "2018-10-08 04:36:56.0" modified_timestamp: "2018-10-08 04:36:56.0" active: true created_by: 236 modified_by: 236 dcm_id: 313 url_slug: "At-risk-of-redundancy-letter" meta_description: "Create an at risk redundancy letter with step-by-step guidance from Rocket Lawyer. Start your redundancy process correctly using this risk of redundancy letter." time_to_complete: "10 minutes"
Informing employees of the risk of redundancy shows that you are following a fair and consistent redundancy procedure and that you are concerned about employees welfare. It ensures employees are aware of the situation at an early stage of the process, and gives them the chance to explore alternative options before being made redundant. Whats the next step after sending an at-risk of redundancy letter? More than just a At risk of redundancy letter template, our step-by-step interview and guidance makes it easy to create your document. Easily create online, download, print and sign your free At risk of redundancy letter in minutes. 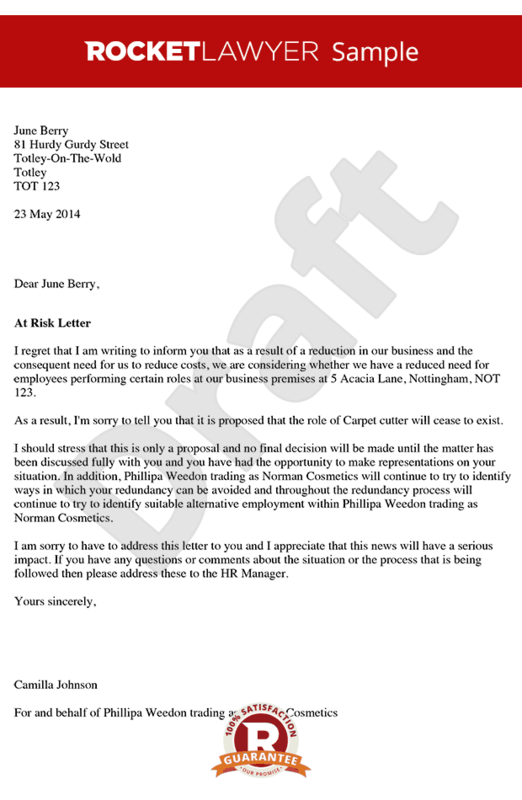 This document is also sometimes called: Letter informing employee of the risk of redundancy.